Q: After I click on an internal link in a PDF document such as a bookmark, it takes me to that link location. How can I go back to the location in the PDF where I was before clicking the link? 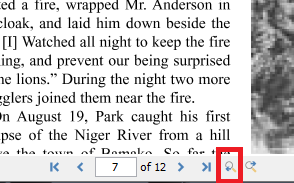 A: You can use the Previous View button to go back to the previous location in the document. On the bottom navigation toolbar, click on the Previous View icon. You can use Next View to go forward to the link location again. It makes it easy to toggle back and forth between the 2 locations.